Two peas in a pod... Danny and the HDS Gen II Touch that is. Coastal Patrol, Coastal Patrol, this is Trade-a-Boat logging in for the day. Without a sounder and GPS it’s like fishing blind. We never would’ve found this fishy drop-off without the HDS Gen II Touch. See how the latest Lowrance marine electronics perform on our Stabicraft 1650 Fisher giveaway boat. There’s a simple science to gearing up for any big fishing adventure: less is more. You want to pack and install all the gear and equipment you need, while making sure it has a dedicated purpose on the trip – more toys equals more problems. This concept holds especially true for marine electronics. Our Stabicraft 1650 Fisher giveaway boat was always going to be fitted with the latest gear, but it was going to spend long periods offshore and offered, we decided to keep things simple and to-the-point. After a long search we settled on Lowrance marine electronics as a suitable match for our fishing boat. These marine electronics were put to the test when we took the Stabicraft 1650 into the field for the Jack’s Lap tour on the East Coast. 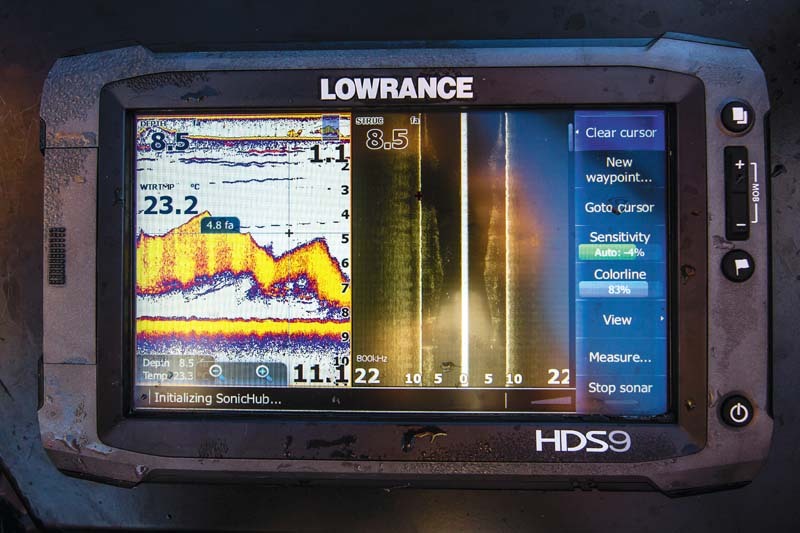 Here’s how these Lowrance marine electronics performed in the field. Why is the HDS Gen II Touch showing two bottoms? Oh wait, that’s a bait ball! The crème de la crème of the trip was no doubt the Lowrance HDS 9 Gen 2 Touch fish finder unit flush-mounted into the dash of the Stabicraft 1650 Fisher. It’s full of features like the intuitive touchscreen, inbuilt Structure Scan, crystal clear Broadband Sounder and meticulous mapping – this thing had the boat covered 40km east out to sea and 4km west up a windy river. With Structure Map and GoFree Wireless capabilities these marine electronics also allow you to create your own maps. You can even control the Lowrance HDS 9 from my smartphone. Navionics charts locked and loaded were also an essential, especially when fishing around the Great Barrier Reef. Another handy contraption was the seamless integration between the Lowrance HDS 9 Gen 2 Touch and the 100 hp Mercury four-stroke outboard motor. Via an NMEA 2000 gateway you can view boat engine data right off your sounder screen – pretty snazzy. Used for: finding juicy bait balls and marking big predators. 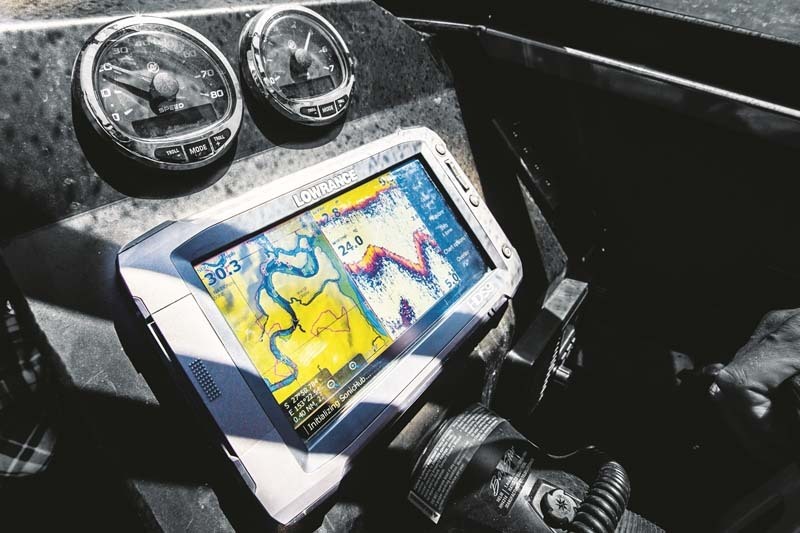 Structure Map and GoFree Wireless lets you make your own maps while the HDS 9 Gen 2 Touch works seamlessly with the 100hp Mercury FourStroke outboard. Beats and fishing go together like a sausage sandwich goes with tomato sauce – Jack Murphy can’t imagine jigging for kingfish without an electro groove pumping in the background. On the Stabicraft 1650 Fisher, the Lowrance Sonic Hub did the job nicely – you just drop your phone/iPod into the dock and then control it via the HDS display. Used for: boosting morale when a 20kg GT has just busted you off. There’s a liberating feeling to being miles and miles out to sea – it must be the inner adventurer in all of us. There’s a serious side to it too though – it can be bloody dangerous without the proper safety gear. In the Stabicraft were two Lowrance VHFs; one hard-wired into the battery while the other was a handheld with its own battery. Having two units ensures you’ve got a backup if your batteries die or you have an electrical problem. Used for: staying safe when all you can see is 360 degrees of empty horizon. Like what you see? Our Stabicraft 1650 Fisher giveaway boat is fitted with Lowrance marine electronics. Plus, we're also giving away a 2015 Majestic Sierra Xtreme off-road caravan worth a cool $57,990. The Ultimate Adventures giveaway package is worth more than $100,000. Find out how to enter. We take you through the many features of our Stabicraft 1650 Fisher giveaway fishing boat.